Architects are asked to engage with an increasingly vast inventory of social and political problems. But where does engagement happen, and what does it involve? One need not leave the studio to understand that architecture is already embroiled in any number of worldly problems. The sense that architecture turns on small things is met with a growing consensus that even the smallest, most quotidian aspects of architectural design turn on large-scale systems and pressing ethical dilemmas. The line between system and architecture is itself increasingly blurry, and with it the role and responsibility of the architect. While the architect’s role in engaging large-scale problems is under debate, their political consciousness is remarkably consistent. In the face of climate change, the global debt crisis and myriad other dilemmas, architects seek to make invisible problems sensible. Research is an expression of their political ethos. A growing number of architects dedicate themselves to research, listening for new idioms about space and design that are normally overlooked or refused in the planning and management of large-scale infrastructural systems. Consider the range of infrastructures that architects now bear witness to: waste, militarization, surveillance, energy, informatics and logistics, to name a few.1 Not only are these infrastructures large and geographically distributed, but they are also steadfast in their secrecy and resistance to public scrutiny. Architects and their collaborators enter into the fray in order to interpret the inner workings of a system for a wider audience. In the process, they also experiment with their role as observers, trading hats as writers, activists and teachers. Waste is exemplary of the conditions within which their research now operates. It is a world whose mechanisms are intentionally shrouded from view, and is popularly associated with histories of pollution and subsequent political struggles over landfills, incinerators and toxic dumps. Its work and workers remain undervalued and invisible to the majority of society. At the same time, waste is under fresh scrutiny in design. Research about its spaces and systems seeks to make legible those things that society refuses to see. New architectural works follow suit, integrating visible aesthetics, visitors centers and other forms of public engagement into an architecture that until recently resisted engagement of any kind. The design of research and the design of new facilities coalesce around a shared ideology of bringing the consequences of waste-making into greater visibility. Drawing on the example of waste and its spaces, I imagine the architect in the recycling facility and other infrastructural spaces as a provisional figure trying to make sense of his or her role in large scale, politically charged problems. When an architect sets foot in a recycling facility or landfill, he or she enters into conversation with protagonists of various stripes—not only clients, but also workers, management professionals, community groups, engineers and activists. Much of the insight and critical awareness of their counterparts in other fields remains strikingly absent from a great deal of design research about waste and other large-scale systems. All too often, architectural research creates a division of labor between the insights of the observer and those of the observed. The design problems that ensue are familiar: earnest efforts to make the invisible visible overemphasize the transgressive character of an outsider looking in, at the cost of understanding how insiders already look inward and around their environment. With the help of anthropological theory and writing, I explore other ways for research to be involved in its sites. What roles might the architect assume alongside those that they research and design for? The architecture of waste management is reliably opaque to its urban surroundings, shrouded behind hastily constructed corrugated walls and barbed wire. In North America, its off-the-shelf skin and bones of Butler Building parts and rusty enclosure systems are cobbled together in order to keep the machines and the people who sort waste hidden from the public. In spite of this, a wave of recently minted facilities shed new light on trash. Projects such as Annabelle Selldorf’s Sims Municipal Recycling Facility in Brooklyn bring garbage into view for an architectural audience2 —not to mention, introduce architecture to the manifold audiences that come together around garbage: community groups, environmentalists, design review boards and the ever-influential if politically expedient “tax-paying public.”3 Architectural design is front and center in wider efforts to make waste disposal more visible to society, but its ability to question the terms and consequences of waste’s invisibility remains circumscribed in a number of important ways. American Reclamation Recycling Facility, Glendale, CA, 2014. Photo courtesy of Curt Gambetta. Architectural authorship of waste management facilities is a relatively new phenomenon. In the United States, for instance, amendments to the Resource and Recovery Act in the early 1980s and subsequent state-level legislation laid the groundwork for greater investment in facilities such as landfills and recycling centers. In time, increased investment and civic consciousness about waste prompted the industry to clean up its image, mobilizing architects as service providers in the design and construction of facilities. Though high profile projects by Selldorf, Ennead and Steven Holl herald the entry of elite architectural firms into the waste industry, regional practices such as J.R. Miller and Associates in the Southwest United States have been working in the industry since the early 1990s. In spite of promises of greater visibility and civic engagement, architects in the United States remain compromised in their ability to radically reinvent the contact between waste infrastructure and the public. Requests For Proposals, design competitions and other modes of solicitation demand that architecture be vested in maintaining the relative invisibility of waste management facilities in American cities. Most new facilities continue to be sited on the periphery of cities, occupying urban blind spots such as industrial landscapes and hinterlands. The architecture of visual engagement: “Big Vortex” smoke ring generator, Amagerforbrænding Waste Treatment Plant, realities:united in collaboration with Bjarke Ingels Group. 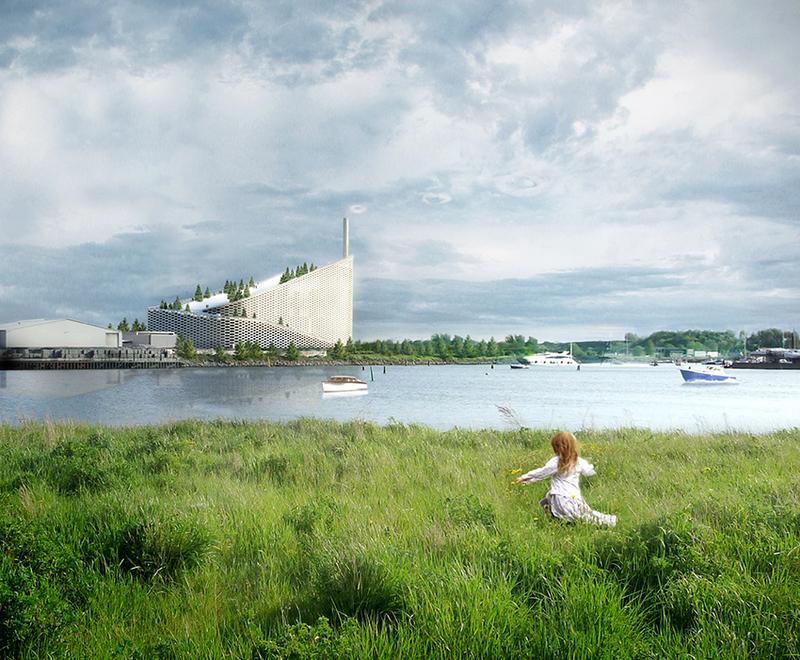 Rendering courtesy of Bjarke Ingels Group. Still, projects of this order are exceptions, not the rule. The ordinarily understated architecture of better design is enlisted to assure that companies and regional sanitation boards appear as good neighbors to surrounding communities—an effort to produce a public, branded image for an industry that is subject to increasing scrutiny by community groups and municipalities. With the exception of visitor’s centers and other educational spaces, most of the inner workings of a facility are off-limits to architectural design.5 Systems for sorting recyclables, for instance, are sold by engineering firms as a proprietary kit of parts. Transportation specialists design connections between the interior of a facility and external forms of infrastructure such as roads and rail lines. The architecture of flow is thus the provenance of an increasingly fragmented cadre of specialists, relegating architectural expertise to their interstices. But the architect’s role as a service provider does not preclude his or her ability to be critical of a system like waste management. Rather than debate the quantity or quality of architecture as a design corps for the industry, why not question the nature of its commitments altogether? Undoubtedly, architectural practice and education are committed to fulfilling a responsibility to the public through the provision of professional services. Research is an important, if often unacknowledged, aspect of its service. But the architectural discipline’s commitment to research positions it to undertake a more independent role in accounting for political, social and environmental problems. As a matter of fact, architects already position themselves as potent observers of dilemmas that resist social accountability. In doing so, they undertake the politically charged task of making the invisible visible, a mantle whose ideology has received little critical reflection. To make the invisible visible assumes an inner world into which an outsider, such as an architect, enters into and makes visible. But waste is not easily confined to an interior. Contemporary design research encounters phenomena, such as waste, that resist clean demarcations between inside and outside worlds. Ubiquitous, dispersed and categorically leaky phenomena challenge the ideology and role of an outsider/researcher who bears witness to foreign and hidden worlds. By assuming the role of an observer, the architect today encounters a series of epistemological concerns that share considerable precedent—and shared histories—with the social sciences. In particular, insights in contemporary anthropology about multi-sited research and collaboration provide a language for reimagining how design research is implicated in the dynamics of large-scale systems. Drawing on the theoretical writings of anthropologist George Marcus and others, I propose that the ideology of “getting inside infrastructure” be joined by other ways of being involved with one’s research site and subjects. Researching the social life of waste: Kevin Lynch, Waste and Loss Interview, 1981. Conducted for the development of his final book, Wasting Away (1991), Lynch undertook a series of interviews about ordinary attitudes towards waste and its disposal, extending his lifelong concern for concepts about space to the cultural politics of waste-making. Courtesy of MIT Libraries, Institute Archives and Special Collections, Cambridge, Massachusetts, Kevin Lynch Papers. All Rights Reserved. Of its many tools of social engagement, the analysis and management of information is tantamount. 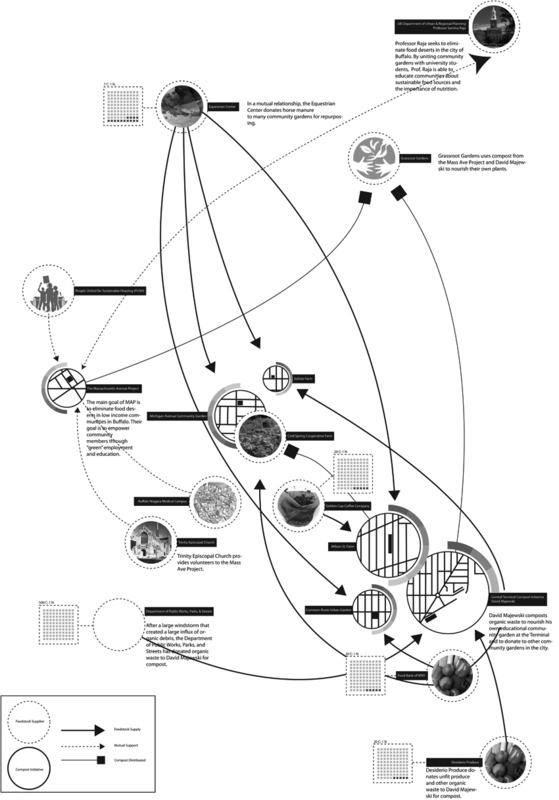 The management and translation of data about social groups and quantifiable phenomena into diagrams, animations and other forms of visualization is arguably as fundamental to contemporary architectural education as basic drawing, and is part and parcel of how the profession communicates itself to its clients and the public at large.8 Though forms of information gathering and analysis are everywhere in the profession, the interpretation of data in contemporary design education is better documented.9 The pedagogical format of the “research studio” is emblematic. In his short but insightful genealogy of the research studio, Kazys Varnelis suggests that contemporary research studios such as Rem Koolhaas’ Harvard Project on the City draw “on the processes of information gathering, analysis, and synthesis that an architect undertakes in the early phases of design, utilizing the architect’s skills in structuring visual and verbal information into a coherent whole.”10 Privileging analysis over architectural design, the research studio uses uniquely architectural sensibilities to translate data into a rhetoric of interpretation. 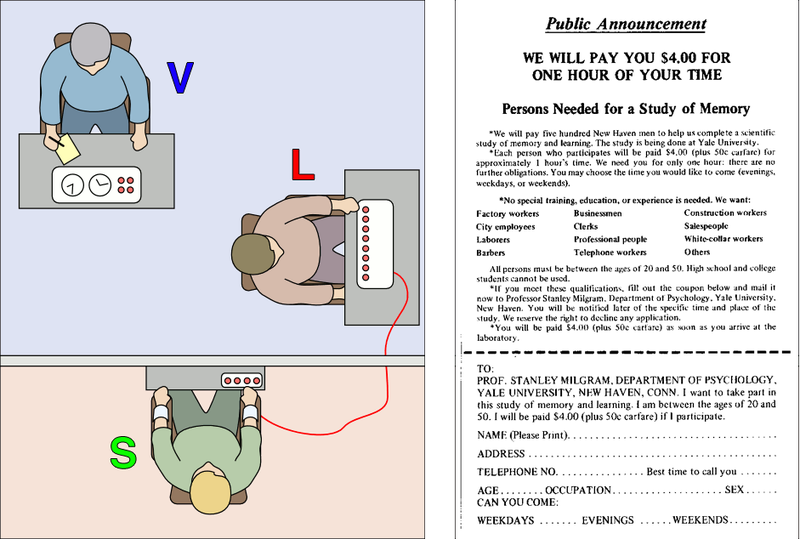 The user study: Joseph Veliz, Terminal Island: Juxtaposed Publics drawing from “The Space of Infrastructure” design studio at Woodbury University taught by Curt Gambetta, Spring 2013. 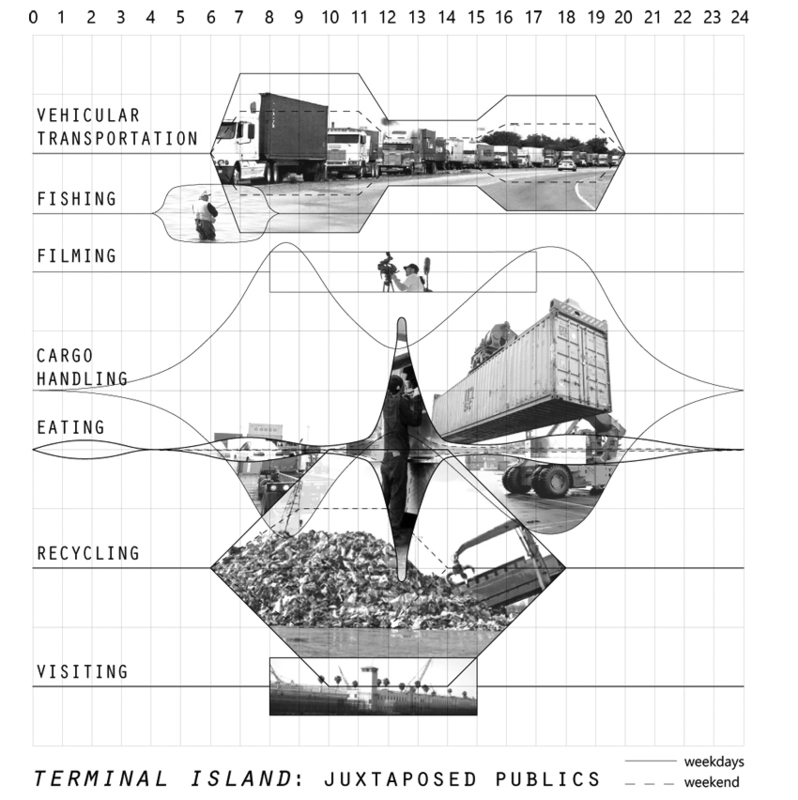 Inspired by OMA’s temporal diagrams of their unbuilt project in Yokohama, Japan, Veliz analyzes the intersection of use patterns between different constituencies of the Port of Long Beach, CA, and the waste-to-energy facility adjacent to it, including longshoremen, truckers and facility workers. Image courtesy of Joseph Veliz. Information is also mobilized as a political “front” for architectural practice, an ethics of “being informed.” Architect Alejandro Aravena’s recently penned manifesto for the 2016 Architecture Biennale is illustrative of this ideology. He implores architects to engage more and better information about society, arguing that “architects have a responsibility to engage in broad conversations that ensure we are properly informed about all the parameters of a given project.”11 Aravena stops short of calling for more immediate forms of engagement, such as direct observation or collaboration, preferring that architecture itself operate as an “open system” for the inclusion, transmission and analysis of information. More inputs into what informs design will, he hopes, generate greater inclusivity for underrepresented populations and problems. The survey: Bijan Hazrati, What Goes Here drawing from “The Space of Infrastructure” design studio at Woodbury University taught by Curt Gambetta, Spring 2013. 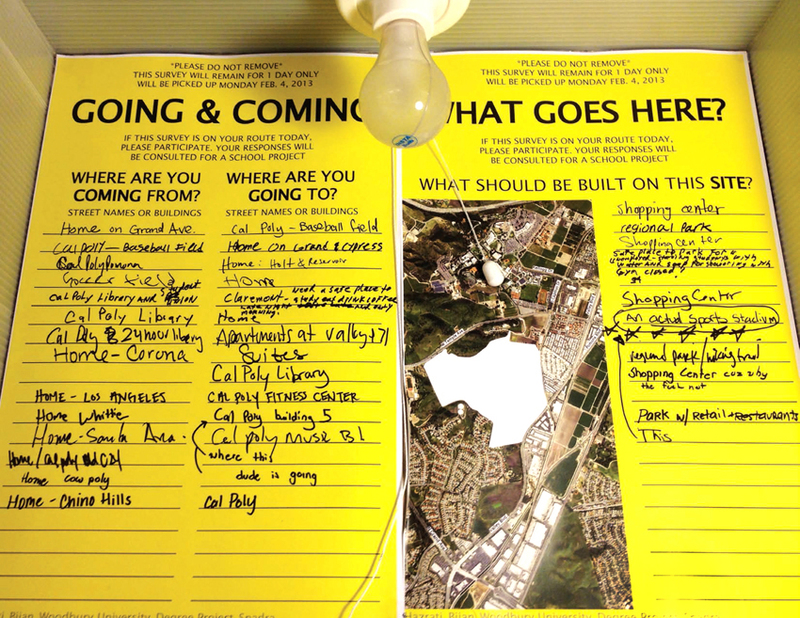 A site-based survey of ideas for the de-commissioned Spadra landfill near Pomona, CA. Image courtesy of Bijan Hazrati. Detail, responses from “What Goes Here?” Image courtesy of Bijan Hazrati. Wittingly or not, architects and design students who engage in such research practices inherit the problems of social science when they adopt its methods. Geography is one such example. Anthropological concepts are less acknowledged, but equally salient. Notions of complicity in ethnographic fieldwork, for instance, are especially helpful in refocusing ideas about research in architecture away from information gathering to the complicated work of site-based observation.15 Complicity is essential to any research project, architectural, anthropological or otherwise. Consider the example of waste management. At minimum, researchers must make concessions to the concerns of a company or municipal agency in order to gain access to a recycling facility or landfill. They might further participate in its forms of work or representation in order to learn more about its workings and workers. They are also responsible to the community or advocacy groups that they solicit for perspectives on the same facilities. The researcher might further align themselves with the priorities of advocacy and activist groups. Whether inside or outside the walls of a facility, research about infrastructural systems demands that the researcher be complicitous in the codes and procedures that mark the system. The image of a researcher entering into a foreign context—in this case a waste management facility—presupposes an inside and an outside, and that an outsider enters into an inside world in order to understand it better. Anthropologists and cultural theorists have for a number of decades questioned the structure, motives and efficacy of this ideology of fieldwork, even if many aspects of it continue to be upheld.18 Anthropology’s historical alignments with colonial power and ongoing paradigms of socioeconomic development were scrutinized in the discipline’s methodological introspection that occurred during the 1980s and 90s, which reflected on the many complicities entailed in developing a rapport with research subjects and the institutions that granted access to them.19 What kinds of value systems and structures of power, for example, made it possible for a researcher to travel and conduct research about “primitive societies,” or for the sociologist to enter into spaces of urban poverty? Moreover, what relationships of power did fieldwork posit between the anthropologist and informant, and how were such relationships articulated or glossed over in ethnographic texts? From containment to large-scale circulation: recorded traces of common garbage, colored by waste type. From “Trash Track,” MIT Senseable City LAb. Image courtesy of the MIT Senseable City Lab. http://senseable.mit.edu/trashtrack/index.php. Like anthropological fieldwork, design research about porous, large-scale issues such as waste complicate the assumption of a conceptually and physically bounded space within which research is conducted. Certainly, facilities are difficult for “outsiders” to access. But the people that work inside these facilities are also outsiders. Changes in their environment and conditions of work are not experienced uniformly—they are felt by different actors across different places simultaneously. In this context, architects, managers, workers and engineers may experience a shared sense of being outside, of not knowing the sources and causes of large-scale shifts in the value or toxicity of trash and other forms of waste. Who is an insider in a company like Waste Management, a company that is large enough and geographically distributed to approximate the workings of a state bureaucracy? Furthermore, the notion that there is an inside of waste infrastructure is difficult to uphold given that toxic chemicals, smells, unwanted trash and myriad other forms of glut bleed outward into transport networks, aquifers and other vectors. It is everywhere, even when you don’t see it. Much as Marcus reflects on what he calls the changing “mise-en-scene” of anthropological fieldwork, the changing conditions and objects of architectural research behoove us to question the ideology of site-based research. To do so, it may be useful to begin by recognizing another form of complicity, one that Marcus suggests is defined by a shared sense of being “complex or involved” that is opposed to commonplace definitions such as “partnership in evil activity.”22 Given that research problems in design are increasingly multi-sited, as well as spatially and temporally dispersed, how can design research experiment with its involvement in “being here and there,” rather than merely “being there,” to again borrow from Marcus?22 If not the outsider working to get “inside,” what roles might he or she assume? In assuming the role of an observer, architects witness and document phenomena alongside others who scrutinize their circumstances. Representing and reflecting on their insights introduces voices that are otherwise written out of design problems about new facilities, urban landscapes and infrastructural design. It attends to the concepts that informants use to describe the spaces that they work in and their problems. It listens for alternatives that workers, managers and activists already speculate on, and their spatial idioms. Recognizing their insight demands that architects listen more to voices outside of the field, not less. I borrow the concept of adjacency from anthropologist Paul Rabinow, who envisages it as a virtual space wherein an observer observes observers.25 Think, for example of an anthropologist like Rabinow, who studies a scientist conducting research. 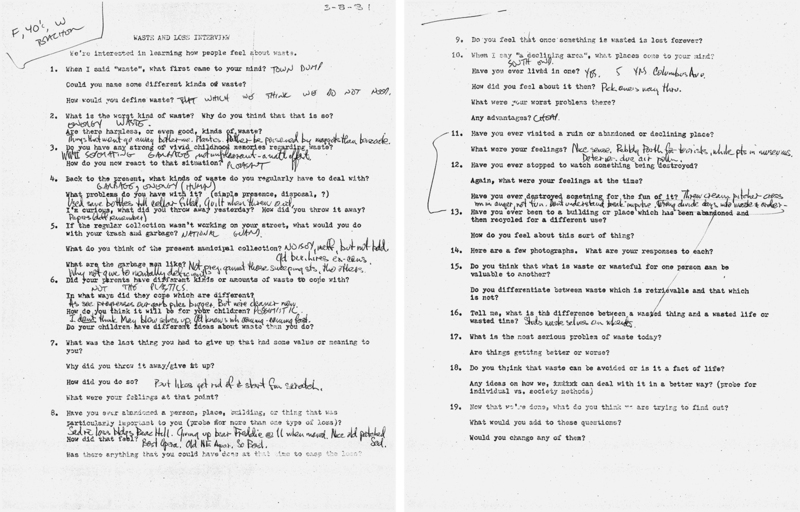 Rabinow asserts that occupying a position of adjacency allows questions to emerge that would otherwise be unimaginable if the researcher were to constrain herself to the obligations and representational genres of those she observes.26 The observer, in this case an anthropologist, tells a different kind of story, he writes: one parallel to but entirely different from the plot line of journalism or the representational strictures of scientific papers.27 One’s adjacency to others upholds the differences between their institutional, intellectual and personal commitments and his or her own. According to Rabinow, the researcher asserts objectivity by remaining disinterested in the research subject’s obligations and career paths, even where and when he or she observes them. Consider further the spatial idioms of advocacy. 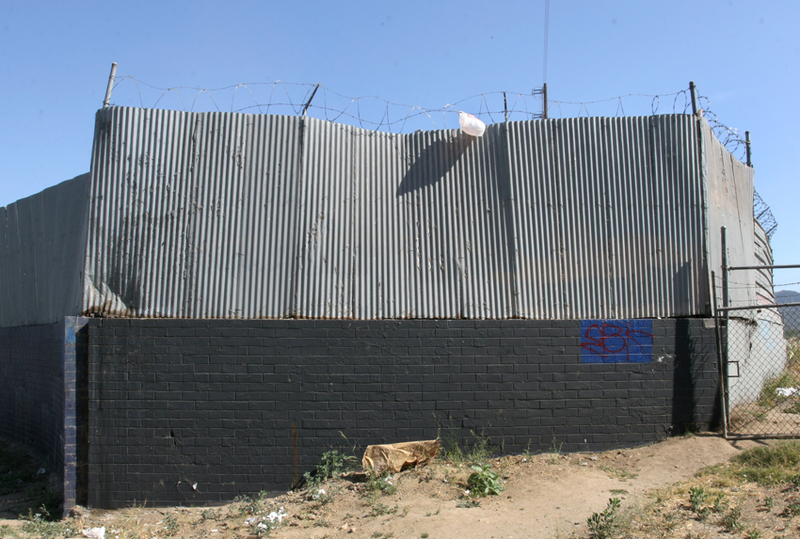 In an interview in 2014, a number of labor activists in Los Angeles associated with the Don’t Waste LA coalition relayed a number of troubling observations to me about labor conditions in the Southern California waste industry.29 They described how companies rely on temporary and undocumented workers, and how bodies are treated like cogs in a machine—an old but sadly urgent dilemma. Laboring bodies, many of them female, are accorded minimal space in sorting lines. Workers often feel trapped and overwhelmed by the bins of waste they are asked to fill and push. They are denied any space to congregate and rest: bodies in motion, without space. Our conversation underscored the imbrication of space with problems of dignity, inequality and safety. My questions about the architecture of facilities were met with curiosity and interest. Together, we imagined the possibility of advocacy about space and design in the industry, a yet unexplored zone of experimentation. In part, our research made use of conventional techniques of spatial analysis. We learned from interviews and site visits with urban gardeners, farmers, civil engineers, a regional waste management company, lawyers and advocacy organizations. Our informants painted a different picture of waste than official explanations of its containment and disappearance. Instead, they described a porous landscape: matter, smells and toxins escaped many of the legal, social and physical thresholds that were designed to contain them. Our drawings indexed this porosity. We analyzed, for instance, how dangerous particulate matter escaped from landfills, arguing that, when seen through the lens of particulate matter, the aerial boundaries of the landfill were much bigger than the soil, plastic and fences that contain it. Students also mapped the circulation of organic waste in Buffalo, representing a network of reciprocal exchange between organic waste producers and composters in the city that was independent of municipally-sanctioned forms of waste management. Reciprocal networks of organic waste in Buffalo, NY. Research and drawing by Christa Trautman, “Networked Urban Composting,” project in the “The Assembly of Trash” seminar and exhibition at Buffalo School of Architecture and Planning, taught by Curt Gambetta, 2011-12. Image courtesy of Christa Trautman. http://assemblyoftrash.net/. Our informants’ stories and concerns informed our maps and diagrams. But they also made their own maps of urban space. A great deal of our informants’ work involved the identification of otherwise invisible boundaries associated with trash, ranging from toxicity and smell to value and conflicting definitions of land use. Much like the architect’s sketchbook, measuring tape and camera, or the planner’s survey, instruments play an important role in observing the byproducts and consequences of trash. Instruments such as the air quality monitoring bucket are critical to advocates mapping air pollution in the absence of adequate regulation by the state. The bucket, which is an adapted plastic restaurant storage bucket manufactured by an advocacy group in California and distributed to partner groups such as the Clean Air Coalition in Buffalo, uses negative pressure to inhale outside air. Affected communities are trained by advocacy groups to monitor their own air—opening up the act of monitoring to individuals and assuring basic expertise in the production of evidence. Once collected, air quality sample bags are sent to an independent laboratory for evaluation. The lab results are used to lobby the EPA to more accurately identify levels of pollution for use as evidence in legal proceedings. 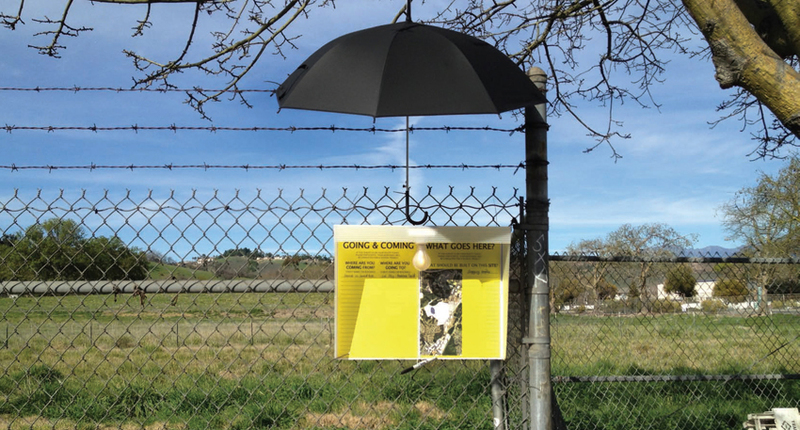 While our research documented observers of air quality, compost and other phenomena related to waste, we also sought to speculate on the margins of their work. In empirical studies, drawings and the design of a prototype, we experimented with how air quality might involve other publics and spaces. Inspired by the aesthetics of vapor monitoring badges worn by toxic clean up crews, scientists and workers, one student imagined colorful membranes that would register otherwise imperceptible changes in particulate matter, VOCs (Volatile Organic Compounds) and other airborne byproducts of landfills. Other studies were empirical, staging sticky surfaces in different urban settings in order to analyze the prevalence of particulate matter in the air. 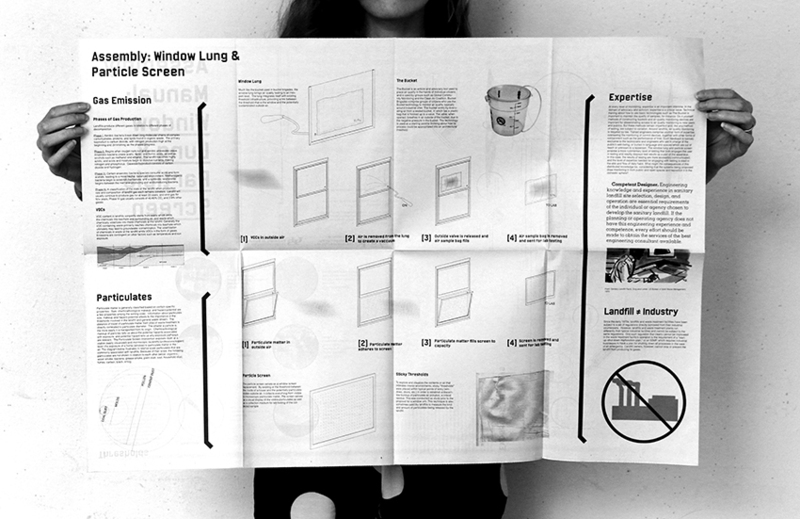 Following these studies, the seminar constructed a prototype for a “Window Lung:” inserting the mechanics of the air quality monitoring bucket into a domestic window. Imagined as a typology for houses that are sited near landfills, the project was unabashedly experimental and open to failure. Connecting the space of advocacy with the space of domesticity raised more problems than it solved. How would expertise be assured? Would a fixed expression of monitoring undermine the spatial and temporal agility of the activist’s bucket? 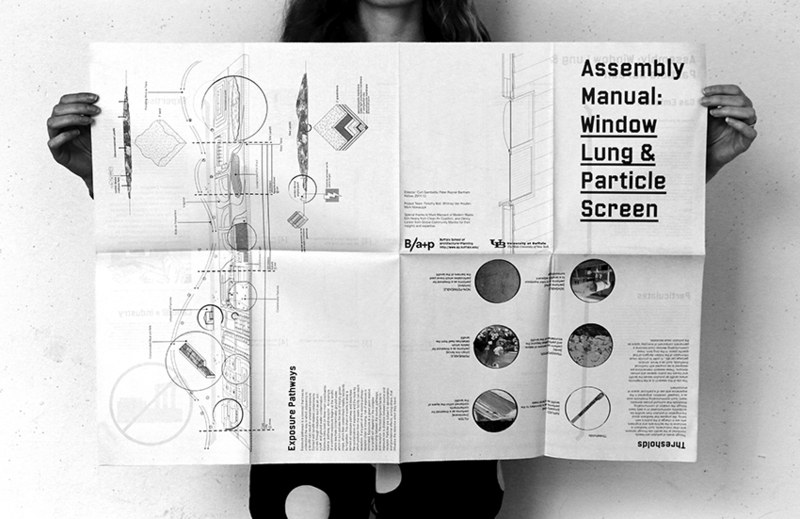 Assembly Manual: Window Lung and Particle Screen, reverse side. Image courtesy of Curt Gambetta. Though some of our informants were enthusiastic about our work, and in some cases eager to appropriate it, others were cautious and outwardly critical. Our research resisted immediate functionality for industry or advocacy efforts, a fact that was troubling to some of our counterparts. We sought to learn about air quality monitoring in Buffalo, but our work was not oriented towards advocacy-based imperatives of training and mobilizing community members to monitor air quality. One of our primary informants, a local air quality monitoring activist, was unconcerned by our autonomy from their work, expressing interest in our architectural studies of air quality as a potential advocacy tool. On the other hand, another national level activist was disturbed by our relative distance from the air quality monitoring movement—communicating his disdain for the project as a waste of time for advocates like himself. In hindsight, given our de facto alliance with air quality advocates and other self-proclaimed “grass roots” work in the city, should we have been more involved in their priorities? First hand observation also opens design research to the concerns and imagination of its informants. The questions that it raises can, in Rabinow’s words, “pique the native’s curiosity,” a transgression from the day-to-day imperatives of the system at hand.34 But it goes further. Marcus and Holmes, for instance, envision a collaborative relationship between the observer and the observed, wherein the informant, also a researcher or inquisitive subject, is not only curious, but also invited to appropriate and redefine the observer’s research agenda.35 Here, collaboration is not equated with consensus building, a frequent conceit of collaborative and participatory models of social engagement. 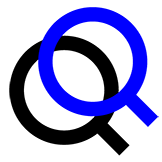 Free of common institutional and intellectual goals, it preserves the uniqueness of its participants’ expertise and background, while introducing the potential for disciplinary problems to spin off into new milieus. Collaboration of this order invites experimentation with ways of being involved in the work of others, rather than shrugging off involvement as a necessary evil. Still, who has time to think their context anew, and who does not?36 It is, without a doubt, the luxury of the expert, and it bears reminding that the mutual inquiry that Rabinow, Marcus and Holmes have in mind is largely a meeting of equals: other experts. Establishing a conversation with intellectual equals may well be the most productive space for design inquiry to make a difference. But I have something more in mind. Waste disposal is colored by histories of racism and inequality, disproportionately burdening vulnerable populations with sanitary labor and proximity to incinerators and landfills.37 In bringing waste into view, we are also bringing into view the life experiences of people who are asked to do dangerous work on behalf of a public that sees their bodies and lives as disposable, dirty and invisible. Granting these individuals greater dignity through visibility is an architectural trope, but it begs to be asked: do those who work in facilities desire this kind of exposure? Opening up architectural research to appropriation allows our counterparts to define their own priorities, leaving open the possibility that research and design is refused, or that its work will be appropriated to other ends. Mierle Laderman Ukeles, Touch Sanitation performance, 1977-80. 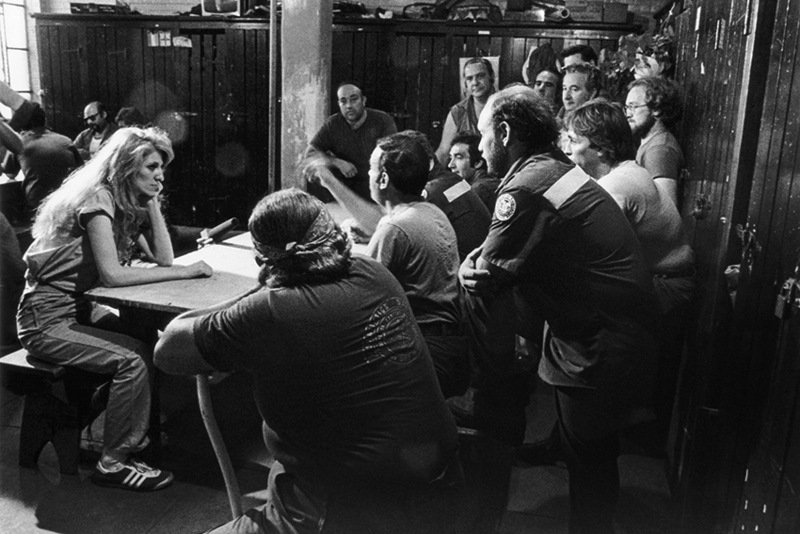 Ukeles sits at a table with workers of New York City Department of Sanitation. Courtesy of Ronald Feldman Fine Arts, New York. Mierle Laderman Ukeles, barge ballet in Touch Sanitation performance, 1984. With the New York City Department of Sanitation. Courtesy of Ronald Feldman Fine Arts, New York. Elsewhere, Ukeles writes that she wanted to avoid the sound-byte mentality of journalism and social-scientific research.40 Her work resists the performance of objectivity, even as it asserts her role as an artist. I take her work as analogous, not equivalent, to research. In displacing and redistributing roles, Ukeles dons many of the codes and procedures of sanitation workers. Her participation in sanitary practices is joined by an invitation to her counterparts to participate in the structure and play of artistic labor. Collaboration extends the responsibilities of maintenance and art to actors who are by definition independent of the activity that they are participating in, as when the tugboat captain lines his barges up in the service of aesthetic play. Indeed, Ukeles leaves the tugboat performance open to appropriation by her counterpart boat captains, which can be understood as a radical relinquishment or deferral of artistic authority. Much as Ukeles questions the division of labor between work and art, might architects and designers also question the division of labor in their research? The division of intellectual labor between architect and informant is also a division of spaces, a distinction made between the studio and the research site. In contrast, the involvement of architects in complicated political and environmental problems render such distinctions porous and untenable, even though they never fully go away. The distanced, bleary-eyed labor of studio-based research is joined by the messy, surprising world of first-hand experience, opening design problems up to the insight and imagination of others. In the process, novel inquiries about space and design are introduced to systems and actors who are unfamiliar with architectural concerns, but also to an architectural profession and discipline that has until now largely ignored them. Curt Gambetta is an architectural designer and PhD student in the School of Architecture at Princeton University. He was formerly the Peter Reyner Banham Fellow at the Buffalo School of Architecture and Planning in New York and a teaching fellow at the Woodbury University School of Architecture in Los Angeles. The author would like to thank Michael Powell, Hanna Garth, George Marcus, Neeraj Bhatia, Carson Chan, Keith Murphy and the editors of ARPA Journal for their gracious reading of earlier drafts of this paper. Research for the paper was supported by the Peter Reyner Banham Fellowship at the University at Buffalo and the Woodbury University School of Architecture.